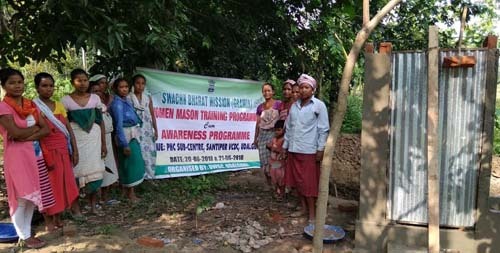 The Public Health Department of Udalguri has taken up a unique initiative to empower the women of the region by conducting a training programme on women mason under Swachh Bharat Mission (Gramin). The programme was initiated with the help of two Self Help Groups viz. Jeuti SHG and Rupali SHG whose group heads had undergone the training on women mason at Barpeta District in the month of May. After discussing the matter with the women of Santipur VCDC in Udalguri District, a group of 10 women came forward to undergo the training programme. The Public Health Engineering Department conducted a two-day long training programme at PHC sub-centre in Santipur Village near the Indo-Bhutan area of Udalguri district on June 20-21 last. The programme was chaired by Executive Engineer(PHE), Bhupen Saikia; District Nodal Officer(SBM-G), Nameshwar Tayung; Technical Officers, Ramiz Raja Choudhury and Injamamul Islam. It is pertinent here to mention that Udalguri is the second district to impart women mason training in Assam after Barpeta. The programme consisted of detailed theoretical information about the twin pit toilet followed by the construction of twin pit toilet. The constructional training was given by two male masons as resource person. After the completion of the training the women would also receive a certificate of participation in the programme. Though the official training is of two days unofficially it will continue till the women have adequate knowledge of the construction. This programme initiated by the PHE of Udalguri District will empower the women and help them be self-reliant in the society. Apart from construction of toilets and other structures they will also carry awareness activities to bring a change in the mindset of the people for better hygienic conditions in the society.